MINNEAPOLIS, Apr. 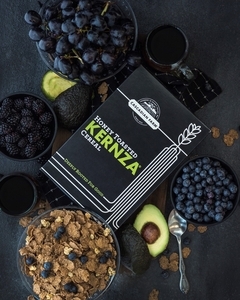 10 /CSRwire/ - Cascadian FarmTM, a pioneer in the organic food movement, is working to advance climate-beneficial foods with the launch of its small-batch, limited-edition Honey Toasted Kernza® cereal. The brand has released only 6,000 boxes – to receive one, Cascadian Farm is encouraging consumers to join its mission to help advance climate-beneficial foods through its fundraising site - DeeplyRootedForGood.com. All proceeds will benefit The Land Institute to advance further research on Kernza®, a perennial grain (intermediate wheatgrass) and wild relative of annual wheat, whose deep roots show promise to benefit the planet by capturing carbon from the air and storing it in the ground. In 2017, Cascadian Farm and parent company General Mills announced their work with The Land Institute (TLI) to help commercialize Kernza. Early research shows Kernza’s long roots may help preserve soil, enhance soil health, and reduce nitrogen movement into ground and surface waters. Farmers who produce Kernza don’t need to till and replant the crop every year, minimizing disruption to the soil. Cascadian Farm is committed to helping create a larger-scale market for Kernza by 2040 through work with partners, as well as scientists and farmers to improve yields. Commercializing Kernza on such a large scale is an ambitious goal. Currently, there are about 1,200 acres of Kernza in production and the yields are relatively small – about one-quarter that of annual wheat. The limited-edition cereal is a first step in creating a market for the grain. Cascadian Farm plans to use the grain in more of its products from cereal to snacks as more Kernza becomes available. Cascadian Farm is also growing a half-acre test plot of Kernza on its home farm in the Skagit River Valley of the Cascade Mountains in Washington. According to its farm manager, Ashley Minnerath, no one has tried growing Kernza in the unique weather conditions that occur on the farm. People can show their support for the development of climate-beneficial foods like Kernza perennial grain by visiting DeeplyRootedForGood.com. A variety of donation levels are available, starting at $25. All proceeds directly benefit The Land Institute. At the $25 level, Cascadian Farm will send a box of its limited-edition Toasted Honey Kernza cereal, while supplies last. Supporters at higher levels will also have their names listed on a plaque at the Cascadian Farm home farm next to the Kernza test plot which serves to educate and inspire visitors about Kernza and its potential to have a positive impact on the environment. For more information, visit DeeplyRootedForGood.com. Cascadian Farm, a pioneer in the organic food movement was founded in 1972 in the Skagit Valley of the Cascade Mountains of Washington. As part of the General Mills family of natural and organic brands, Cascadian Farm has grown beyond its original home farm and is a pioneering supporter of farmers who use practices that regenerate the land and their communities. For more information, visit www.cascadianfarm.com. General Mills is a leading global food company that serves the world by making food people love. Its brands include Cheerios, Annie's, Yoplait, Nature Valley, Häagen-Dazs, Betty Crocker, Pillsbury, Old El Paso, Wanchai Ferry, Yoki, Blue and more. Headquartered in Minneapolis, Minnesota, USA, General Mills generated fiscal 2018 proforma net sales of U.S. $17.0 billion, including $1.3 billion from Blue Buffalo. In addition, the General Mills share of non-consolidated joint venture net sales totaled U.S. $1.1 billion.